Created by myself and artist Jon Davis-Hunt for 2000 AD, Age Of The Wolf is an apocalyptic adventure in which werewolves have overrun the world, as a centuries-old prophecy causes a full moon to rise every night. Set primarily amid the ruins of London, the series follows a woman named Rowan Morrigan, who fights to not only defy her destiny but also retain her humanity as civilisation crumbles throughout this three-part series. Nine episodes, with art by Jon Davis-Hunt and letters by Simon Bowland, in 2000 AD #1700-08, Sept-Oct 2010.
it to be the end of days. As winter falls and tensions rise, a young woman named Rowan Morrigan finds herself at the heart of an ancient prophecy that dictates mankind will devour itself. Ten episodes, with art by Jon Davis-Hunt and letters by Simon Bowland, in 2000 AD #1772-81, Feb-May 2012. 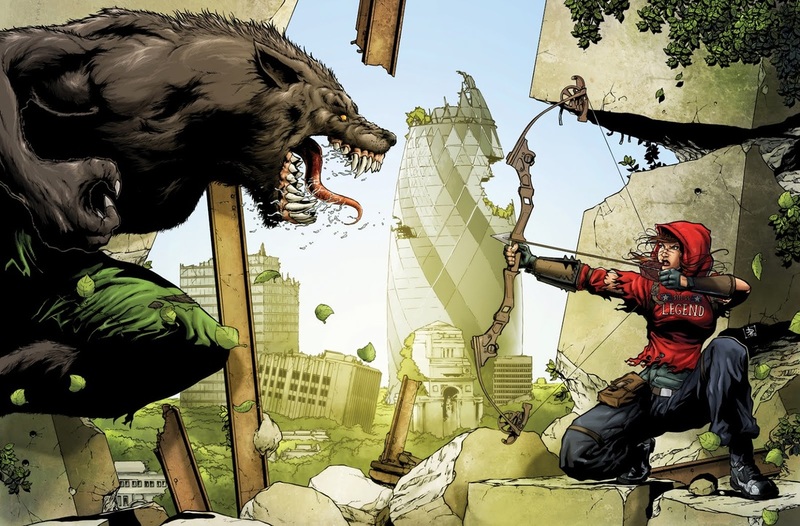 Fifteen years after the events of the first series, a strange forest has sprouted from the ruins of London and Rowan Morrigan – now a mysterious figure known as ‘Little Red Robin Hood’ – must defend the human survivors against ravenous werewolves, ruthless slavers and strange post-apocalyptic cults. Ten episodes, with art by Jon Davis-Hunt and letters by Annie Parkhouse, in 2000 AD #1840-50, July-Sept 2013. Another 20 years on and the world is ruled by a race of intelligent werewolves. Few human survivors remain, but Rowan is among them, now a grizzled rune-witch dedicated to exterminating the lycanthropes and breaking the 'moonspell' that threatens humanity with extinction. The aging warrior must embark on an epic hunt when her surrogate daughter is captured by an ambitious werewolf matriarch determined to bring about her own day of reckoning. 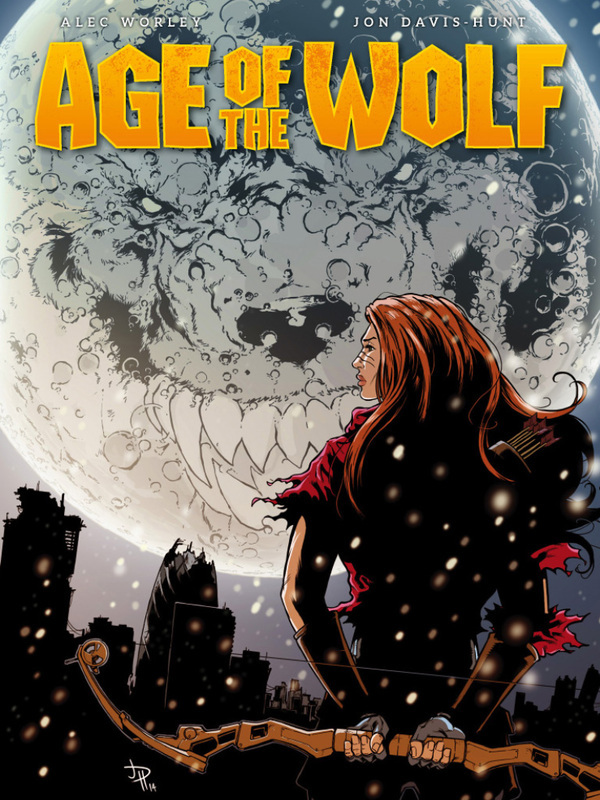 Rebellion collected all three series of Age Of The Wolf as a single graphic novel in October 2014. It's available from Amazon UK, Amazon US and in both print and digital from the 2000 AD webstore. in the first series of Age Of The Wolf, she’s in her early 20s. Stubborn, level-headed, principled and with an aptitude for mechanics, Rowan discovers she has been selected by an ancestral Nordic prophecy to become a sacrifice to a monster and thus ensure the doom of all mankind. As she fights to defy the prophecy, Rowan learns of a magical force known as the ‘Wyrd’, a runic alphabet that gives her control over the future. By the second series, She Is Legend, Rowan is in her mid-thirties and has trained her body and mind to become a guardian of the strange forest that London has become. Wracked with guilt over the destruction caused by the prophecy, Rowan strives to find a way to undo the ‘moonspell’ and save humanity from extinction. In the third and final series, Wolfworld, Rowan is in her fifties, a battle-scarred hunter struggling to save her species from extinction.